In addition to my henna-style paintings, I also do henna body art. I only use organic henna powder and make my own paste for a great color. I have been doing henna for years and all designs are original and drawn free-hand. More recently, you can find me doing henna at local fairs and am available for private parties and other events. 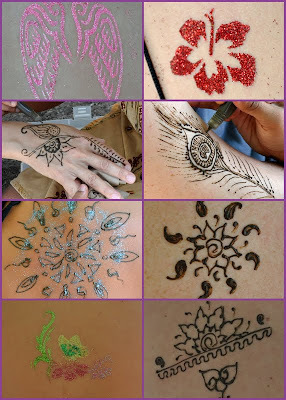 I also offer glitter tattoos, specially for kids who might not have the patience for henna. For the glitter tattoos, I use only FDA approved body glue (last 4-5 days) or Elmer's school glue mixed with body glue (last a ay or so). I can do glitter tattoos both free-hand and with stencils. Please leave me a message on the contact form or on facebook to make appointments.